The supplement nicotinamide (NAM), a form of vitamin B3 and precursor of nicotinamide adenine dinucleotide (NAD+), protected the liver function, glucose metabolism and overall health of aging mice, but did not increase longevity, in a study designed to mimic recent human trends in obesity, poor diet and related metabolic disorders. 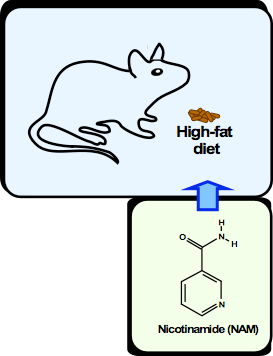 A team of researchers from the NIA Intramural Research Program’s Translational Gerontology Branch (TGB), sought to expand on recent studies showing that other NAD precursors, nicotinamide riboside (NR) and nicotinamide mononucleotide (NMN), protected against obesity in mice fed a high-fat diet. The team found that mice on the high-fat diet supplemented with NAM for over 12 months showed improved glucose metabolism, less signs of fatty liver, and better physical performance than expected for mice their age (a two-year old mouse being roughly equivalent to a 70-year old human). These results were published in the March 6, 2018, issue of Cell Metabolism. An increase in NAD+ (a metabolite vital to cellular energy, stem cell self-renewal, resistance to neuronal stress and DNA repair) stores has been shown to counteract metabolic problems and tissue damage. The researchers demonstrated that NAM supplementation also reduced diet-induced oxidative stress and inflammation, which indicated a possible protective force against damage to DNA caused by age and high-fat diet. The overall effect was an improvement in health, but no change in longevity, for the mice on high-fat diet treated with NAM. The team, including first authors Sarah J. Mitchell, Ph.D., and Michel Bernier, Ph.D., and led by Rafael de Cabo, Ph.D., interprets these results as potentially interesting for human health, as obesity and related metabolic disorders like diabetes and fatty liver are well-documented and are on the rise in many countries. They hope future studies in this realm may help reveal how NAM supplementation could be explored for use in humans, ultimately, to counteract harmful effects of poor diet while improving physical and metabolic performance. Mitchell, et al. Nicotinamide Improves Aspects of Healthspan, but Not Lifespan, in Mice. Cell Metabolism. 2018: 27, 667-676. Research supported by the NIA/NIH IRP program, NIH/NIA MERIT award R01 AG028730 grant (D.A. Sinclair), and under a CRADA between Glaxo Smith-Kline and NIA.